An affidavit of support, (USCIS Form I-864), is required for all immediate relatives of U.S. citizens and lawful permanent residents, (which include parents, spouses, and unmarried children under the age of 21, including orphans) and other relatives who qualify for immigration to the United States under one of the family-based preferences. An Affidavit of Support is not required for an immigrant who is self-petitioning for immigration benefits because they are the battered spouse or child, or the widow/widower of a U.S. citizen or legal permanent resident. By bringing a relative to live permanently in the United States, you are accepting legal responsibility for financially supporting this family member and therefore you become your relative’s sponsor by completing and signing an affidavit of support. This means that you have filed or are filing a USCIS Form I-130, Petition for Alien Relative or USCIS Form I-600, Petition to Classify Orphan as Immediate Relative. This legally enforceable responsibility lasts until your relative becomes a U.S. citizen or can be credited with 40 quarters of work (usually 10 years). If the immigrant receives any “means-tested public benefits,” such as, Food Stamps, Medicaid, Supplemental Security Income (SSI), Temporary Assistance for Needy Families (TANF), and the State Child Health Insurance Program (CHIP), the sponsor is responsible for repaying the cost of those benefits to the agency that provided them. If the sponsor does not repay the debt, the agency has the right to sue them in court to get the money owed. There are certain types of programs which are not counted as means-tested public benefits, for example, emergency Medicaid; short-term, non-cash emergency relief; services provided under the National School Lunch and Child Nutrition Acts, among others. How Do I File an Affidavit of Support? 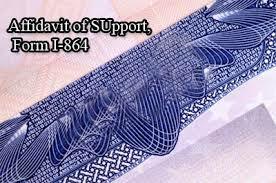 The Affidavit of Support is a Contract between Sponsor and Household Member. If you have a joint sponsor, the joint sponsor must also complete USCIS Form I-864, not Form I-864A. If you are using the income of other household members to qualify for the statutory income requirements, then each household member who is accepting legal responsibility for supporting your relative must complete a separate USCIS Form I-864A, in conjunction with Form I-864, Contract between Sponsor and Household Member. You are required to provide U.S. Federal income tax returns for the most recent tax year as well as proof of current employment and the most recent pay stubs. If you were not required to file a tax return in any of these years you must provide an explanation. If the petitioner’s income is not sufficient, you need to find a co-sponsor who is a U.S. Citizen or Lawful resident. In addition to the same financial documents, the co-sponsor has to provide the proof of his legal status in the U.S. and his or her photo identification. You can have as many joint sponsors as you want. It is not required, though, as each sponsor needs to qualify under his or her own income. Once the affidavit of support is completed, all the necessary documents are compiled, and the affidavit is notarized in the United States or before a U.S. consular or immigration officer, this packet of information should be provided to your relative to submit with his or her application for permanent resident status. What are the income requirements for an Affidavit of Support in 2018? Poverty Guidelines (Form I-864P), provides current minimum income requirements for use in completing Form I-864. The sponsor must prove they can support the relative by providing documentation that their income is 125% above the mandated poverty line for their family, including the sponsor and all other sponsored family members. The sponsor should complete an I-864 Affidavit of Support when the relative has been scheduled for an immigrant visa interview with a consular officer overseas or when the relative is about to submit an application for adjustment to permanent resident status with the USCIS or with an Immigration Court in the United *48 States except for Alaska and Hawaii State. Do I really have to file an affidavit for my husband ? A U.S. citizen petitioning for their foreign national spouse is required by law to file an affidavit of support to guarantee to the U.S. government that his or her spouse, if allowed to immigrate will not become a “public charge”, and if, until the foreign national becomes a citizen he or she collects any “means tested” welfare benefits that the U.S. citizen petitioner reimburses the government. Can my husband’s income be included? His income can be included if it will continue from the same source after he obtains lawful permanent resident status. Can I use the child support that I receive for my daughter as income on Form I-864? Child support is not income. Only income could be used on for affidavit of Support. Please not that, by signing this Form I-864, you agree to assume certain specific obligations under the Immigration and Nationality Act (INA) and other Federal laws. The following paragraphs describe those obligations. Please read the following information carefully before you sign Form I-864. If you do not understand the obligations, you may wish to consult an attorney or accredited representative. What is the Legal Effect of My Signing Form I-864? (This information is taken from Form I-864). If you sign Form I-864 on behalf of any person (called the intending immigrant) who is applying for an adjustment of status to a lawful permanent resident, and that intending immigrant submits Form I-864 to the US Government with his or her application for an immigrant visa or adjustment of status, under INA section 231A, these actions create a contract between you and the US Government. The intending immigrant becoming a lawful permanent resident is consideration for the contract. Under this contract, you agree that, in deciding whether the intending immigrant can establish that he or she is not inadmissible to the United States as a person likely to become a public charge, the US Government can consider your income and assets as available for the support of the intending immigrant. What if I Choose Not to Sign Form I-864? The US Government cannot make you sign Form I-864 if you do not want to do so. But if you do not sign Form I-864, the intending immigrant may not become a lawful permanent resident in the United States. What Does Signing Form I-864 Require Me to Do? B. Notify US Citizenship and Immigration Services (USICS) of any change in your address, within 30 days of the change, by filing Form I-865. What Other Consequences Are There? If an intending immigrant becomes a lawful permanent resident in the United States based a on Form I-864 that you have signed, then, until your obligations under Form I-864 terminate, the US Government may consider (deem) your income and assets as available to that person, in determining whether he or she is eligible for certain Federal means-tested public benefits and also for state or local means-tested public benefits, if the state or local government’s rules provide for consideration (deeming) of your income and assets as available to the person. This provision does not apply to public benefits specified in section 403© of Welfare Reform Act such as emergency Medicaid, short-term, non-cash emergency relief; services provided under the National School Lunch and Child Nutrition Acts; immunizations and testing and treatment for communicable diseases; and means-tested programs under the Elementary and Secondary Education Act. What If I Do Not Fulfill My Obligations? If you not provide sufficient support to the person who becomes a lawful permanent resident based on a Form I-864 that you signed, that person may sue you for this support. If a Federal, state local, or private agency provided any covered means-tested public benefit to the person who becomes a lawful permanent resident based on a Form I-864 that you signed, the agency may ask you to reimburse them for the amount of the benefits they provided. If you do not make the reimbursement, the agency may sue you for the amount the agency believes you owe. If you are sued, and the court enters a judgement against you, the person or agency that sued you may use any legally permitted procedures for enforcing or collecting the judgment. You may also be required to pay the costs of collection, including attorney fees. If you do not file a properly completed Form I-865 within 30 days of any change of address, USCIS may impose a civil fine for your failing to do so. When Will These Obligations End? NOTE: Divorce does not terminate your obligations under Form I-864. Your obligations under a Form I-864 that you signed also end if you die. Therefore, if you die, your estate is not required to take responsibility for the person’s support after your death. However, your estate may owe any support that you accumulated before you die.